In this paper, the authors seek to disentangle what they see as contradictory uses of the term “professionalisation” with reference to adult educator development and training (AEDT). They set out to distinguish professionalisation from professionalism, and to identify the locus of control of AEDT in Germany, the UK and India. In these three countries, all of which have a long tradition of adult education, “professionalisation” and “professionalism” are used interchangeably to describe conflicting purposes. The authors aim to identify and critically explore the organisations and policies which control and support AEDT in their own countries using American sociologist Eliot Freidson’s “third logic” model, and drawing on his juxtaposition of “professions”, “the market” and “bureaucracy”. Applying Freidson’s models to the organisations highlights the role of bureaucracy and that where adult education is concerned, national governments, the European Union and aid organisations not only serve bureaucracy but also support the market rather than operating separately from it. While the term “professionalisation” continues to be used to mean professional development, either by adult educators and representative organisations (as in the UK) or by organisations acting on their behalf (as in Germany and India), it is also used to denote regulation and standardisation issuing from bureaucratic institutions and adult education provider organisations in the interests of the market. The authors suggest that Freidson’s model provides a useful tool for adult educators in other countries to reflect on their professional position and to engage in the development of their own professional standards, both in their own interests and in the interests of those they educate. 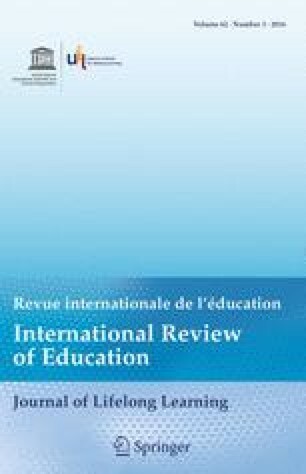 Professionnalisation synonyme de développement et de réglementation: éducation des adultes en Allemagne, au Royaume-Uni et en Inde – Les auteurs de cet article visent à clarifier ce qu’ils considèrent comme usages contradictoires du terme « professionnalisation » dans le domaine du développement et de la formation des éducateurs d’adultes (DFEA). Ils établissent tout d’abord une distinction entre professionnalisation et professionnalisme, et identifient le locus de contrôle dans le DFEA en Allemagne, au Royaume-Uni et en Inde. Dans ces trois pays, possédant chacun une longue tradition en éducation des adultes, les termes professionnalisation et professionnalisme sont utilisés indifféremment pour décrire des objectifs contradictoires. Les auteurs poursuivent le but d’identifier et d’examiner d’un œil critique les organisations et politiques qui contrôlent et soutiennent le DFEA dans leurs pays, en appliquant le modèle de la « troisième logique » du sociologue américain Eliot Freidson et en s’inspirant de sa juxtaposition de « professions » , « marché » et « bureaucratie » . L’application des modèles de Freidson à ces organisations éclaire le rôle de la bureaucratie et montre que dans le cas de l’éducation des adultes, le gouvernement central, l’Union européenne ou les organisations humanitaires non seulement servent la bureaucratie mais soutiennent aussi le marché au lieu d’opérer indépendamment de lui. Le terme « professionnalisation » continue à être utilisé dans le sens de développement professionnel, soit par les éducateurs d’adultes eux-mêmes et leurs organismes de représentation (au Royaume-Uni), soit par des organismes agissant pour leur compte (en Allemagne et en Inde). Mais il est également employé pour désigner la réglementation et la standardisation émanant des institutions bureaucratiques et des prestataires en éducation des adultes dans l’intérêt du marché. Les auteurs suggèrent que le modèle de Freidson fournit un outil utile aux éducateurs d’adultes d’autres pays, leur permettant de considérer leur situation en termes professionnels afin de prendre en main leurs propres normes, dans l’intérêt de la « profession » quelle que soit sa forme, et de ceux auxquels ils dispensent une éducation. We would like to acknowledge the support of the ASEM (Asia–Europe Meeting) LLL (Lifelong Learning) Hub (http://asemlllhub.org/fileadmin/www.dpu.dk/ASEM/frontpage/XL_Large2011.pdf) of the Asia-Europe Foundation (http://www.asef.org). Three authors of this paper, Dr Lesley Doyle, Professor Regina Egetenmeyer and Dr D. Uma Devi, are members of the ASEM LLL Research Network 3 (Professionalisation) and it is through the work of the Network that this paper was conceptualised. Our thanks also go to Professors Barbara Kehm and Michael Osborne of the University of Glasgow for their advice and recommendations on earlier drafts of this paper. AgendaNi (2015). A place for business in education. AgendaNi, 15 June. Retrieved 17 December 2015 from http://www.agendani.com/place-business-education/. Ball, S. (2013). Concept of professionalism [PowerPoint presentation]. Presented to the University and College Union (UCU) on 13 March during a seminar for members entitled “Reclaiming professionalism: Have your say”. London: UCU. Retrieved 7 November 2015 from http://www.ucu.org.uk/professionalismseminar. BIS (Department for Business, Innovation & Skills) (2011). European Commission green paper: Modernising the professional qualifications directive. UK government response. Ref: 11/1297. London: BIS. Retrieved 7 November 2015 from https://www.gov.uk/government/publications/professional-qualifications-directive-response-to-the-european-commission-green-paper. BIS (2012a). Professionalism in further education in the UK. Final Report of the Independent Review Panel. Ref 12/1198. London: BIS. Retrieved 7 November 2015 from https://www.gov.uk/government/uploads/system/uploads/attachment_data/file/422247/bis-12-1198-professionalism-in-further-education-review-final-report.pdf. BIS (2012b). Evaluation of FE teachers’ qualifications (England). Regulations 2007. BIS Research Paper 66. Retrieved 9 March 2016 from https://www.gov.uk/government/uploads/system/uploads/attachment_data/file/32302/12-693-evaluation-fe-teachers-qualifications-regulations.pdf. Chand, P. (2007). Status of adult literacy: A data base for literacy. New Delhi: National Literacy Mission. Retrieved 7 November 2015 from http://lccn.loc.gov/2008419372. Council of the European Union (2011). Council Resolution on a renewed European agenda for adult learning. C 372/1. Official Journal of the European Union, 20 December. Retrieved 7 November 2015 from http://eur-lex.europa.eu/LexUriServ/LexUriServ.do?uri=OJ:C:2011:372:0001:0006:EN:PDF. Dhéret, A., Nicoli, F., Pascouau, Y., & Zuleeg, F. (2013). Making progress towards the completion of the Single European Labour Market. EPC issue paper no.75. Brussels: European Policy Centre (EPC). Retrieved 7 November 2015 from http://www.epc.eu/documents/uploads/pub_3529_single_european_labour_market.pdf. Doyle, L. (2013). The fragility of professionalism in the de-regulated environment. ASEM Education and Research Hub for Lifelong Learning. Policy Brief. Aarhus: ASEM LLL Hub. Retrieved 9 November 2015 from http://asemlllhub.org/policy-briefs/united-kingdom-lingfield-report/. E&Y & FICCI (Ernst & Young and Federation of Indian Chambers of Commerce & Industry) (2012). Knowledge paper on skill development. Learner first. Ernst & Young and FICCCI report, September. Kolkata: Ernst & Young Pvt. Retrieved 19 April 2015 from http://www.ey.com/Publication/vwLUAssets/FICCI_skill_report_2012_finalversion/$FILE/FICCI_skill_report_2012_finalversion_low_resolution.pdf. EC (European Commission) (2006). Adult learning: It is never too late to learn. Communication from the Commission. COM(2006) 614 final. Brussels: Commission of the European Communities. Retrieved 9 March 2016 from http://eur-lex.europa.eu/legal-content/EN/TXT/PDF/?uri=CELEX:52006DC0614&from=EN. EC (2007). Action Plan on Adult learning. It is always a good time to learn. Communication from the Commission to the Council, the European Parliament, the European Economic and Social Committee and the Committee of the Regions. COM(2007) 558 final. Brussels: Commission of the European Communities. Retrieved 9 March 2016 from http://eur-lex.europa.eu/legal-content/EN/TXT/PDF/?uri=CELEX:52007DC0558&from=ENf. Education and Training Foundation (2015). Our priorities [webpage]. London: Education and Training Foundation. Retrieved 9 November 2015 from http://www.et-foundation.co.uk/?s=priorities. EP (European Parliament) (2005). Directive 2005/36/EC of the European Parliament and of the Council of 7 September 2005 on the recognition of professional qualifications. Official Journal of the European Union, 30 September. Retrieved 10 March 2016 from http://eur-lex.europa.eu/legal-content/EN/TXT/PDF/?uri=CELEX:32005L0036&from=EN. EU (European Union) (2007). Treaty of Lisbon amending the Treaty on European Union and the Treaty establishing the European Community, signed at Lisbon, 13 December 2007. 2007/C 306/01. Official Journal of the European Union, 17 December. Retrieved 10 March 2016 from http://eur-lex.europa.eu/legal-content/EN/TXT/PDF/?uri=OJ:C:2007:306:FULL&from=EN. Evans, L. (2008). Professionalism, professionality and the development of education professionals. British Journal of Educational Studies, 56(1), 20–38. Retrieved 7 November 2015 from http://hpp.education.leeds.ac.uk/files/2013/11/HPP2015-2-Evans.pdf. Evetts, J. (2012). Professionalism in turbulent times: Changes, challenges and opportunities. Paper presented at the Propel International Conference Stirling 9–11 May. Retrieved 7 November 2015 from http://www.propel.stir.ac.uk/downloads/JuliaEvetts-FullPaper.pdf. Gallacher, J. (2009). Inquiry into the future for lifelong learning: The Scottish perspective. Leicester: NIACE. Retrieved 18 December 2015 from http://www.niace.org.uk/lifelonglearninginquiry/docs/ifll-scottish-perspective.pdf. GoI (Govermnent of India) (1956). The University Grants Commission Act. New Delhi: Government of India. Retrieved 30 March 2016 from https://indiankanoon.org/doc/535576/. Hughes, D. (2011). So, what will the new NIACE look like, then? [blog post 29 November]. Leicester: Learning and Work Institute. Retrieved 18 December 2015 from http://www.niace.org.uk/our-thinking/blog/“so-what-will-new-niace-look-then”. IIALE (International Institute of Adult and Lifelong Education) (2014). Background [webtext]. New Delhi. Retrieved 18 December 2015 from http://www.iiale.org/background.html. John, N. (2011). Skills development: Sector profile. New Delhi: Federation of Indian Chambers of Commerce and Industry (FICCI). Retrieved 9 November 2015 from http://www.ficci.com/sector/74/Project_docs/SectorProfile.pdf. Kraft, S., Seitter, W., & Kollewe, L. (2009). Professionalitätsentwicklung des Weiterbildungspersonals [Professional development of further education personnel]. Retrieved 7 November 2015 from http://www.die-bonn.de/id/4200. NIACE (National Institute of Adult Continuing Education) (2014) European agenda for adult learning (2012–14). Leicester: Learning and Work Institute. Retrieved 9 March 2016 from http://www.niace.org.uk/sites/default/files/resources/EU%20Agenda%20for%20Adult%20Learning%20-%20Final%20Report%202012-14.pdf. NIACE (2015a). Who we work with [webpage]. Leicester: NIACE. Retrieved 19 December 2015 from http://www.niace.org.uk/what-we-do/who-we-work-with. NIACE (2015b). Making migration work: Labour market and skills solutions. Policy Solutions Number 2, March. Leicester: NIACE. Retrieved 6 November 2015 from https://www.niace.org.uk/sites/default/files/resources/Making%20Migration%20Work%20-%20Labour%20market%20and%20skills%20solutions.pdf. Patel, I. (2009). Policy on adult and lifelong learning: International and national perspectives. In Participatory Lifelong Learning and Information and Communication Technologies (PALDIN), Course 1 (Unit 2, pp. 21–30). New Delhi: Group of Adult Education, School of Social Sciences, Jawaharlal Nehru University (JNU) and Aladin-India. Retrieved 8 November 2015 from http://www.unesco.org/education/aladin/paldin/pdf/course01/unit_02.pdf. Research voor Beleid (Ed.) (2008). ALPINE – Adult Learning Professionals in Europe: A study of the current situation, trends and issues. Final Report. Zoetemeer: Research voor Beleid. Retrieved 6 November 2015 from http://www.ginconet.eu/sites/default/files/library/ALPINE.pdf. Research voor Beleid (Ed.) (2010). Key competences for adult learning professionals: Contribution to the development of a reference framework of key competences for adult learning professionals. Final report Zoetermeer: Research voor Beleid. Retrieved 6 November 2015 from http://www.frae.is/files/Kennarafærni%202010_1168938254.pdf. UCU (University and College Union (2011). Institute for Learning. Retrieved 18 November 2015 from http://www.ucu.org.uk/index.cfm?articleid=5412. UCU (2015). ACE update The Newsletter for Adult and Community Education, Summer issue [online newsletter]. London: University and College Union. Retrieved 7 November 2015 from http://www.ucu.org.uk/media/pdf/2/8/ucu_acenewsletter_summer15.pdf. Zia, B. (2010). The fad of financial literacy? [Blog post, 8 December]. On All about finance. A blog by Asli Demirgüç-Kunt, Director of Research, World Bank. Retrieved 9 November 2015 from http://blogs.worldbank.org/allaboutfinance/the-fad-of-financial-literacy.